Behind the headline news of clashes between Palestinian youths and armed Israeli soldiers, Israel has – as ever – been quietly tightening its grip on Palestinians’ lives in the occupied territories. Last week in Hebron, a current flashpoint, 50 embattled families still living in the Tel Rumeida neighbourhood faced a new restriction on movement designed to help free up the area for intensified Jewish settlement. Some of Tel Rumeida’s residents could be seen silently queuing at the local checkpoint to register their ID cards. Anyone not from the neighbourhood and not on the military’s list will be barred from entering. Their response differed starkly from the reaction 21 years ago, when residents faced a similar order. Then, the entire neighbourhood refused to register. Israel punished them with a curfew for six months, allowing the families out for a few hours a week to buy food. How to respond to military orders of this kind stands at the heart of a debate that has revived among Palestinians about the relative merits of armed struggle and non-violent resistance. A poll in the early summer showed 49 per cent of Palestinians aged between 18 and 22 supported an armed uprising. By September, after the first clashes in Jerusalem, that figure had surged to 67 per cent. The volatility can in part be explained by an inevitable thirst for revenge as Palestinians watch compatriots being killed and maimed by Israeli soldiers. But it also reflects a void of Palestinian leadership and strategy. Instead, Palestinians have been buffeted into polarised camps that, put simply, pit Hamas’ rhetoric of armed struggle against the stalled diplomacy of Mahmoud Abbas and his Palestinian Authority. Non-violence once earnt a central place in Palestinian resistance to occupation. During the first intifada of the late 1980s, Palestinians engaged in mass civil disobedience: they refused to cooperate with the military authorities, burnt their ID cards, refused to pay taxes and held strikes. That approach never entirely ended. Today it finds expression in the weekly protests and marches by villages against Israel’s steel and concrete barrier eating away at Palestinians’ agricultural lands. These protests remain largely peaceful, even in the face of unceasing army brutality. But the use of non-violence has been limited to local struggles, waged with the aim of small, isolated victories. It has also invariably coexisted with more violent approaches, from stone-throwing to the current knife attacks. Much of the blame falls to Abbas, who has appropriated the language of non-violence while failing to harness it to a national strategy of resistance. Even the PA’s support for the villagers’ battles against Israel’s wall have been less than half-hearted. In the minds of many Palestinians, non-violence has become tainted by association with Abbas’ years of ineffectiveness: his desperate and unsuccessful attempts both to push Israel into peace talks and to cosy up to Washington. The nadir was his declaration of the “sacred” status of the PA’s security coordination with Israel. It has also not helped that prejudicial demands for non-violence are regularly made of Palestinians by outsiders and dishonest brokers such as Washington. Last month US secretary of state John Kerry singled out Palestinians for blame in the latest clashes. “There’s no excuse for the violence,” he scolded, ignoring decades of Israel’s violent suppression of Palestinian efforts at liberation. Nonetheless, some Palestinian intellectuals are advocating non-violent resistance as they warn against an armed uprising. Palestinians have a right in international law to resist the occupation, even violently, but this group emphasises the futility of violence faced with Israel’s military superiority. Theirs is a pragmatic argument. Similarly, Palestinian businessman Sam Bahour has coined the term “smart resistance”, arguing that all the Palestinian factions should commit to non-violent resistance as a way to national liberation. Both have drawn on earlier strategies of communal solidarity and collective sacrifice – as demonstrated by Tel Rumeida’s inhabitants two decades ago. One of the architects of the first intifada’s non-violent resistance, Mubarak Awad, recently reminded Palestinians that it is no soft option. “It’s about using nonviolence militantly, like a kind of unarmed warfare,” he told an interviewer. He suggests instead refusing to carry Israeli-issued IDs, defying curfews, blocking roads, planting trees on sites intended for settlement, tearing down fences, staging sit-ins and and inviting mass arrests to fill to breaking point Israel’s jails. Such actions require mass participation, mobilising women, children and the elderly – the very groups likely to be excluded by armed struggle. And, as Awad notes, non-violence also needs a people trained in its techniques and principles. That is why he has translated into Arabic the teachings of Mahatma Gandhi and Martin Luther King. Political organisers and strategists like Awad have always topped Israel’s list for arrest. He was jailed and tortured at the start of the first intifada and later expelled to the US. The power of disciplined non-violent resistance, he adds, is that it forces on the occupier a heavy burden: to “deal with our willingness to stand up for ourselves with nothing but our bodies and hearts”. It forces Israelis to “choose what kind of people they are”, and creates division and dissent among the oppressor population, weakening its resolve. It is a challenging message, especially when Israel is so ruthlessly crushing Palestinian hope and dignity. 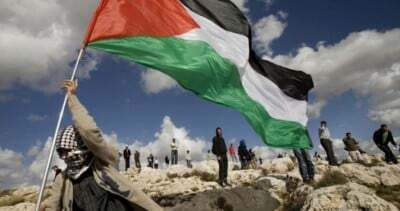 But Awad argues that it is precisely by demonstrating an irrepressible humanity that Palestinians can again discover hope, reclaim their dignity and win freedom.